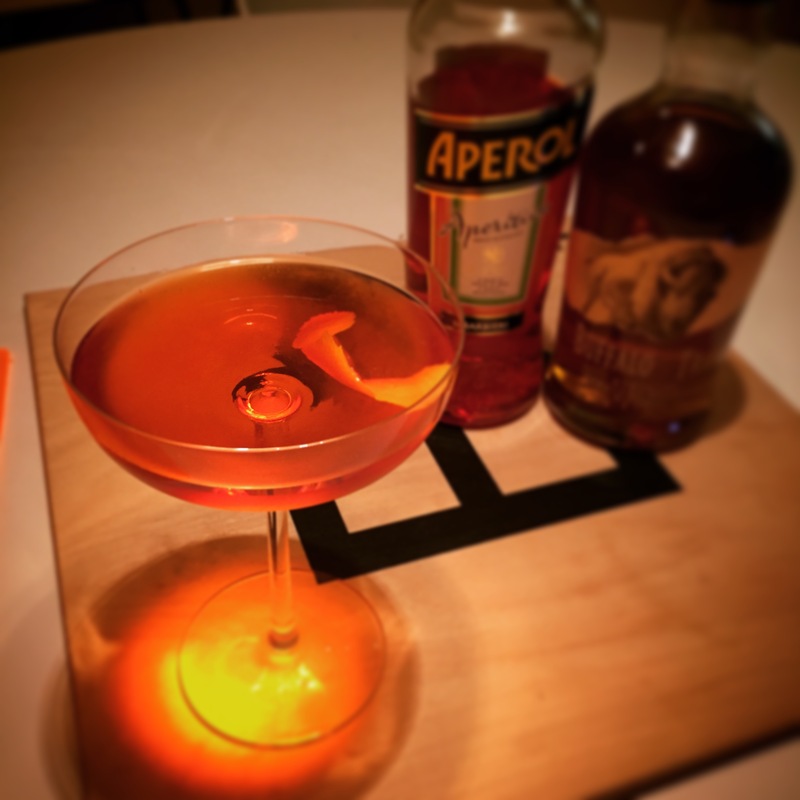 The Boulevardier is a very close relative to the classic Negroni, which I mixed recently. Here, the gin of the Negroni is replaced with whiskey, giving the drink a spicy note. This is a classic recipe (found first in McElhone’s 1927 book, Barflies & Cocktails) that has suddenly found fame again recently as part of the revival of older, neglected cocktail recipes; I think part of that success is that it is such a close relation to the Negroni that people have tried that drink are likely to try this one. And possibly more importantly, it is made from only three ingredients, likely found in most cocktail cabinets, making it easy to try. As the Manhattan & the Negroni, don’t be fooled by the lack of clever ingredients or unusual spirits: the Boulevardier works because it is an absolutely perfect blend of flavours. Somehow this mix of flavours is definitely more French than Italian. I cannot say for certain why, but the Boulevardier name seems totally appropriate; I can imagine a French homme du Monde enjoying one of these at his local Bar Tabac on the way home to his apartment in Paris, whereas a Negroni seems perfect for the Italian uomo di Mondo. As with my usual tastes, I don’t believe a cocktail is complete without a few dashes of bitters, so I added some here. The original recipes don’t call for any, nor do they seem to specify any garnish, but some orange zest seems appropriate. Again, these choices are mine, yours may vary. Stir the ingredients over ice in a mixing glass.